Information on income for the calendar year 1959 was requested from all persons 14 years old and over in the sample. "Total income" is the sum of the amounts reported in P-32 (wage or salary income), P-33 (self-employment income), and P-34 (other income). The figures represent the amount of income received before deductions for personal income taxes, Social Security, bond purchases, union dues, etc. Receipts from the following sources were not included as income: Money received from the sale of property, unless the recipient was engaged in the business of selling such property; the value of income "in kind," such as free living quarters or food produced and consumed in the home; withdrawals of bank deposits; money borrowed; tax refunds; gifts and lump-sum inheritances or insurance benefits. This is defined as the total money earnings received for work performed as an employee. It includes wages, salary, pay from Armed Forces, commissions, tips, piece-rate payments, and cash bonuses earned. This includes money income received from sources other than wages or salary and self-employment, such as net income (or loss) from rents or receipts from roomers or boarders; royalties; interest, dividends, and periodic income from estates and trust funds; Social Security benefits; pensions; veterans' payments, military allotments for dependents, unemployment insurance, and public assistance or other governmental payments; and periodic contributions for support from persons who are not members of the household, alimony, and periodic receipts from insurance policies or annuities. The schedule entries for income are frequently based not on records but on memory, and this factor probably produces underestimates, because the tendency is to forget minor or irregular sources of income. Other errors of reporting are due to misrepresentation or to misunderstanding of the income questions. A possible source of understatement in the income figures was the failure, on occasion, to obtain from the respondent any report on "other money income." For these cases, the assumption was made in the Editing process that no Income other than earnings was received by a person who reported the receipt of either wage or salary income or self-employment income. When no income information for a person 14 years old and over was reported, the Editing procedure for assigning entries for nonresponse was used. The General nature of this procedure is described below in the section on "Collection and processing of data." The tables showing family income include in the lowest income group (under $1,000) those that were classified as having no 1959 income, as defined in the census. Many of the families with no income were living on income "in kind," savings, or gifts, or were newly formed families, or were families in which the sole breadwinner had recently died or had left the household. However, many of the families who reported no income probably had some money income which was not recorded in the census. The income data in this report cover money income only. The fact that some families receive an important part of their income in the form of housing, goods, or services, rather than in money, should be taken into consideration. In comparing income data for 1959 with earlier years, it should be noted that an increase or decrease in money income does not necessarily represent a comparable change in real income, because adjustments for changes in prices have not been made in this report. In tabulating family income for the 1950 Census, when only the head's income was reported, the assumption was made that there was no other income in the family. 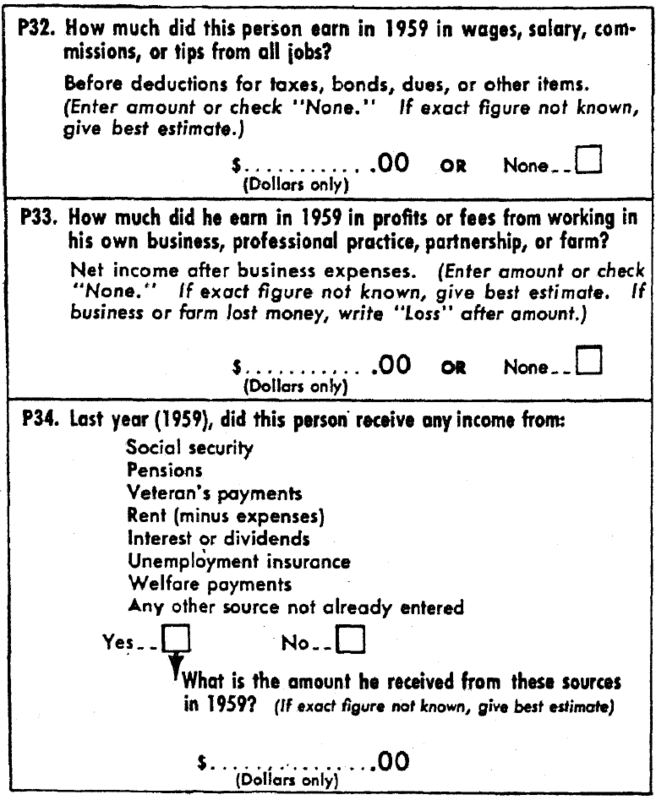 In the 1960 Census, all nonrespondents on income (whether heads of families or other persons) were assigned the reported income of persons with similar demographic characteristics. A comparison of the income distributions of families with head 65 years old and over for the United States from the 1960 Census and from the March 1960 CPS is shown in table A. The CPS distribution excludes families for which complete income information was not reported, whereas the census distribution includes nonrespondents, with their income estimated on the basis of known demographic, social, and economic characteristics. The differences at the extremes of the distributions as shown above are larger than would be expected from the standpoint of Sampling Variability. A number of studies are now being made which may help in explaining these differences, including, for example, a study of matched questionnaires for persons who were enumerated in both the March 1960 CPS and the 1960 Census. For several reasons, the income data shown in this report are not directly comparable with those which may be obtained from statistical summaries of income tax returns. Income, as defined for tax purposes, differs somewhat from the concept used by the Bureau of the Census. For example, certain types of receipts such as veterans' payments, Social Security benefits, and relief payments, which constitute the main income source for some families, are excluded from income tax coverage. Moreover, the coverage of income tax statistics is less inclusive because persons receiving less than $600 (less than $1,200, if 65 years old or over) are not required to file returns. Furthermore, some income tax returns are filed as separate returns and others as joint returns; and, consequently, the income reporting unit is not consistently either a family or a person. Except in New England, an SMSA is a county or group of contiguous counties which contains at least one city of 50,000 inhabitants or more, or "twin cities" with a combined population of at least 50,000. In addition to the county, or counties, containing such a city or cities, contiguous counties are included in as SMSA if, according to certain criteria, they are essentially metropolitan in character and are socially and economically integrated with the central city. In New England, SMSA's consist of towns and cities, rather than counties. A household consists of all the persons who occupy a housing unit. A house, an apartment or other group of rooms, or a single room is regarded as a housing unit when it is occupied or intended for occupancy as separate living quarters; that is, when the occupants do not live and eat with any other persons in the structure and there is either (1) direct access' from the outside or through a common hall or (2) a kitchen or cooking equipment for the exclusive use of the occupants. All persons who are not members of households are regarded as living in group quarters. Group quarters are living arrangements for institutional inmates or for other groups containing five or more persons unrelated to the person in charge. Most of the persons in group quarters live in rooming houses, college dormitories, military barracks, or institutions. Inmates of institutions are persons for whom care or custody is provided in such places as homes for delinquent or dependent children; homes and schools for the mentally or physically handicapped; places providing specialized medical care for persons with mental disorders, tuberculosis, or other chronic disease; nursing and domiciliary homes for the aged and dependent; prisons; and jails. Inmates were not included in the tabulations for this report. A family consists of two or more persons in the same household who are related to each other "by "blood, marriage, or adoption; all persons living in one household who are related to each other are regarded as one family. In a primary family, the head of the family is the head of a household. Other families are secondary families. A "husband-wife" family is a family in which the head and his wife are enumerated as members of the same household. The head of the family is the member reported as the head by the respondent. However, if a married woman living with her husband is reported as the head, her husband is classified as the head for the purpose of census tabulations. The wife of a head of a family is a woman married to and living with a family head. This category includes women in common-law marriages as well as women in formal marriages. A parent of the family head includes father-in-law and mother-in-law as we'll as the father and mother of the head. Persons who are parents of the head of a secondary family were counted as other relatives rather than parents in the tabulations for this report; such persons, however, are negligible in number.